Luscious yellows, greens, pinks, and purples bring the bounty of summer blooms indoors to deliver your heartfelt message with panache. 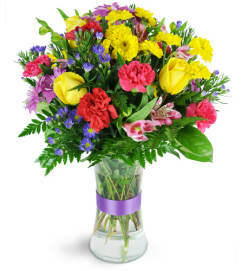 Whether it’s a birthday, a promotion, or a "thinking of you" gift, this summery bouquet is like sunshine in a vase. 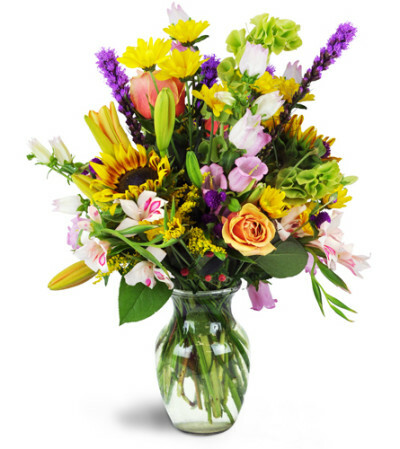 Sunflowers, lilies, orange roses, green bells of Ireland and red hypericum berries tantalize the senses in this exquisite arrangement. 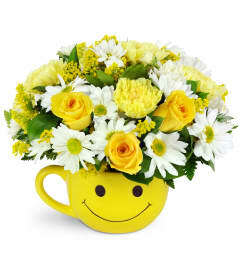 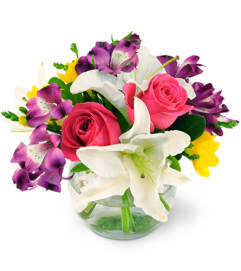 Sunflowers, miniature gladiolus, roses, lilies, and more are stylishly arranged in a classic rose vase.